You know, for a while I was really thinking that this panko stuff might have been all hype. The culinary community has seen its share of hit-and-run fad foods…you know what I’m talking about. If it’s not gnocchi showing up on every Spotted Pig-wannabe-gastropub’s menu (uh, like, two years too late), it’s a rash of clone-ish New York frozen yogurt shops reproducing faster than you can say Afro-Latino-Asian fusion. Not that there’s anything wrong with gnocchi or frozen yogurt (and definitely not with The Spotted Pig); it’s just that after you’ve eaten your eightieth chipotle-soaked, creme fraiche topped cliche, you pretty much never wanna see the stuff again. 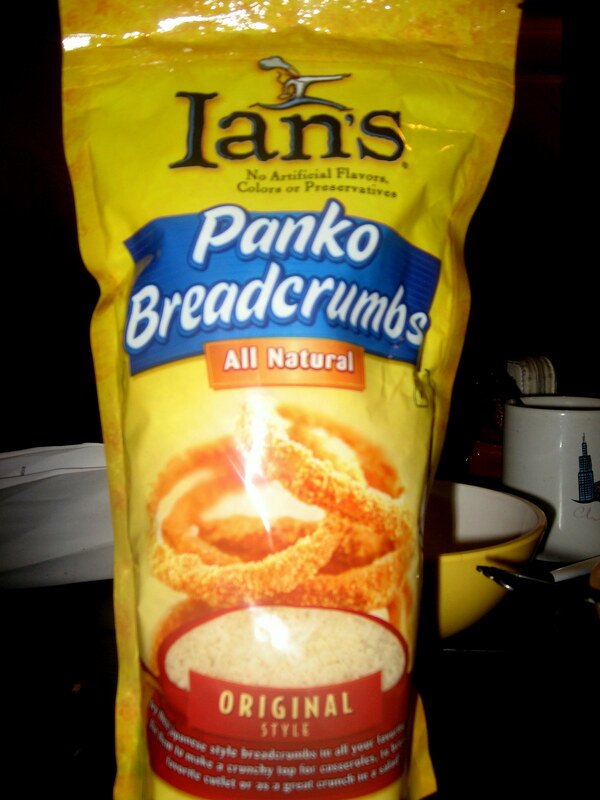 While I can’t say that panko isn’t next in line to be forgotten as quickly as it was hyped up, I am a genuine fan of its uncommon crunch and extreme versatility. Fo’ sho’, misfits. “panko” means child of bread; it’s lighter and crisper than your typical breadcrumbs, and it absorbs less fat, too. You may have unwittingly tried them at a Japanese restaurant, as many roll their tempura in panko before frying. A random visit to another food blog, The Missing Ingredient, reminded me that I’d been meaning to try panko at home. The author of this blog adapted a Food and Wine recipe to make Panko-Crusted Chicken with Mustard Sauce. Because I’m a bit over chicken this week, and wasn’t in a mustard state of mind, I used the recipe as inspiration to do my own thing. 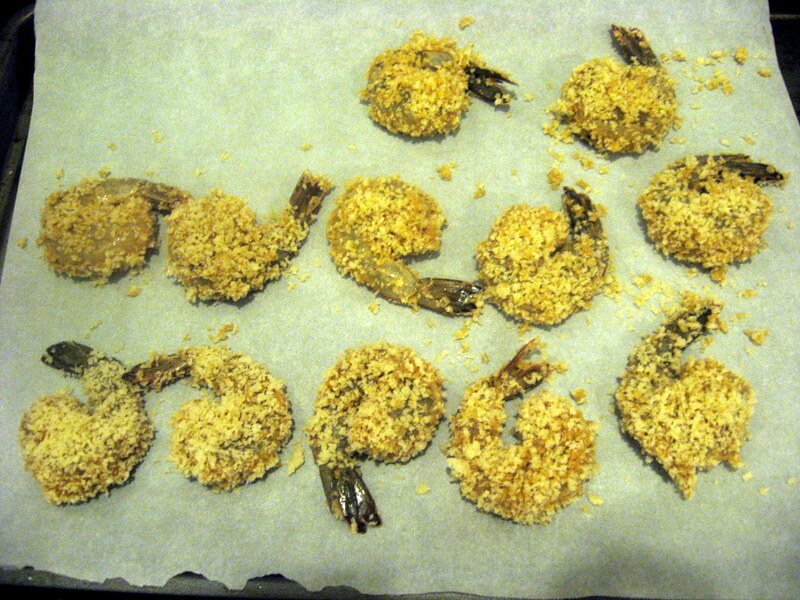 I ended up dipping the shrimp (peeled, but with the tails on), into a thin wasabi-soy mixture that I devised, rolling it in the panko, and then baking it for 15 minutes. This satisfies my innate, lifelong urge to peel things, dip them into wasabi-soy mixtures, roll them in panko, and then bake them for 15 minutes. AND the shrimp don’t scream as piteously as a boyfriend which is HELLO LIKE A MAJOR BENEFIT. Tah-dah-easy as anything, no frying involved. Having officially popped my panko cherry, my thoughts now, naturally, turn to my next high. Will i top a casserole with it? Roll lightly-oiled chunks of vegetables in it before roasting? Sprinkle it on a salad? Sprinkle it on a baby? How about you, gentle misfit readers? Any other uses for my bag of panko? I’ll put my money where my mouth is: the person who comments on this post by Sunday, November 30, with the best original recipe idea using panko crumbs will win a free bag! Preheat oven to 400 degrees F and line a cookie sheet with parchment paper. 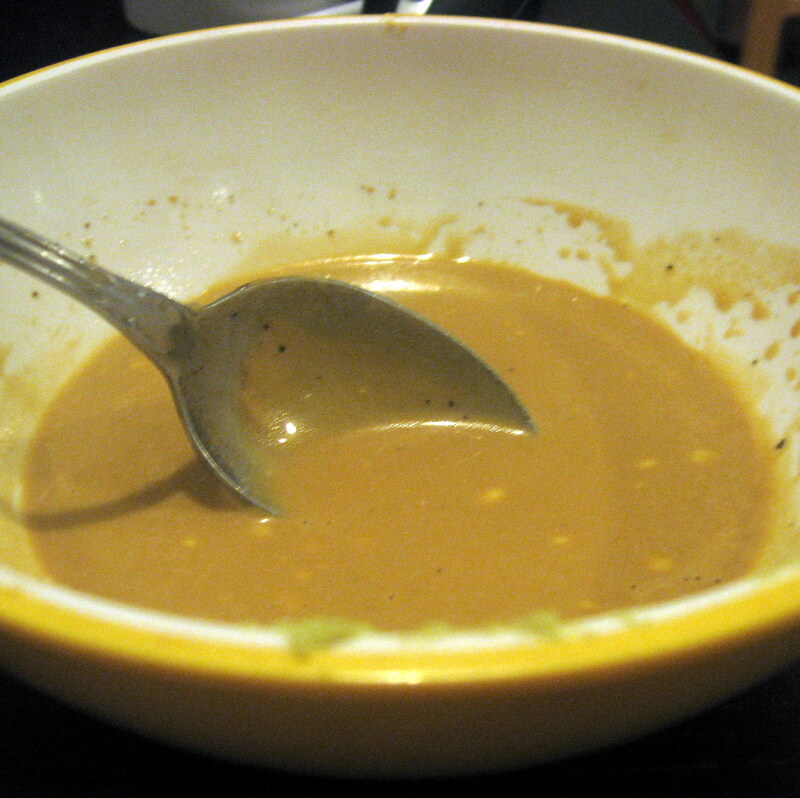 In a medium bowl, whisk together the mayonnaise, tamari, wasabi paste, rice vinegar, olive oil, and enough pepper to taste. 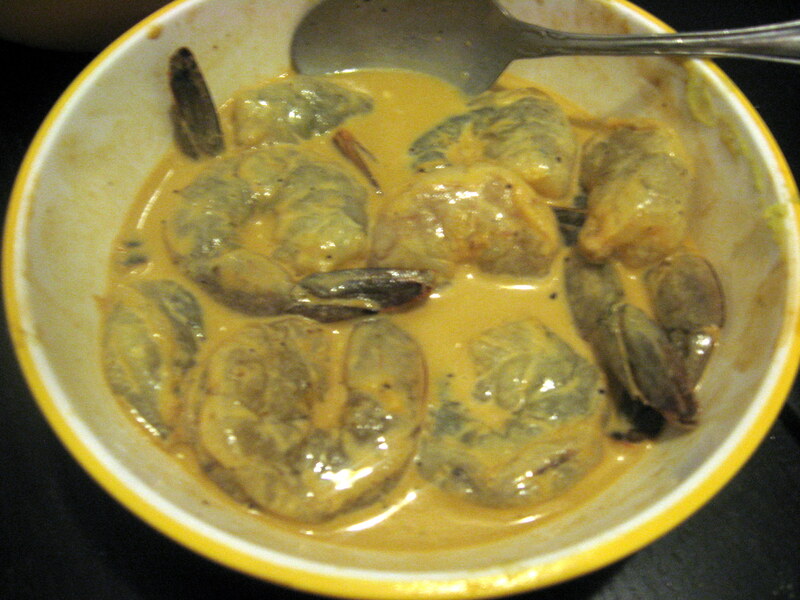 Toss the shrimp with the sauce and set it aside for 10-15 minutes to let the flavors soak in. 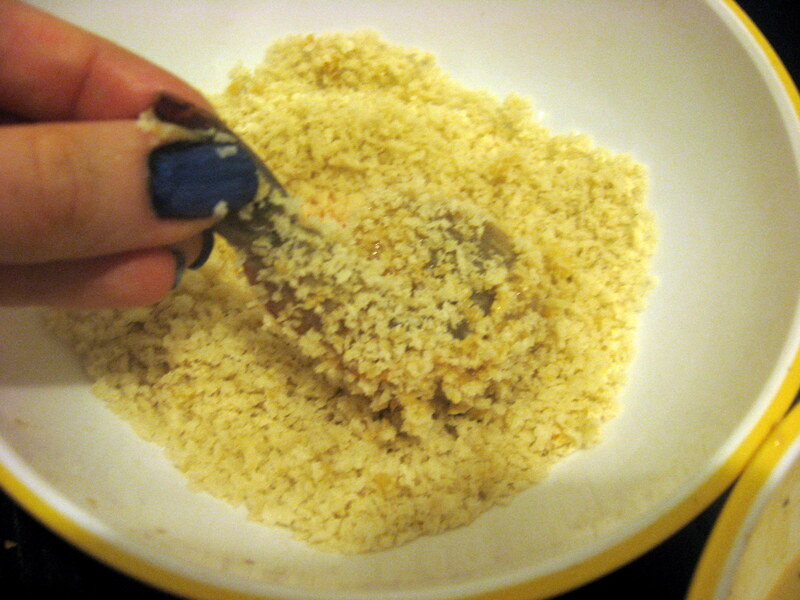 Pour a third of the panko into a shallow bowl (to avoid waste, continue to replenish your panko in small amounts). 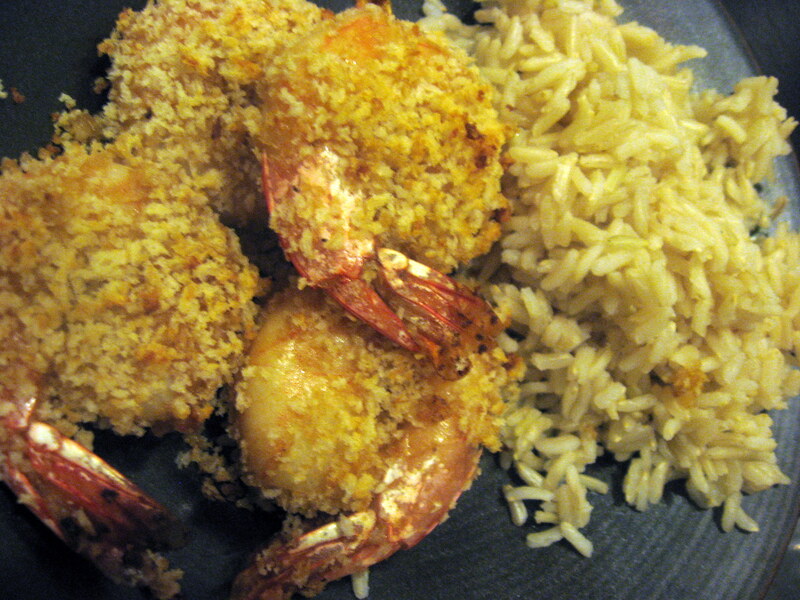 Pick each shrimp up out of the sauce by its tail and drag it through the panko, using your fingers to pat as many crumbs onto it as possible. Gently lay it on the cookie sheet and repeat with the remaining shrimp. 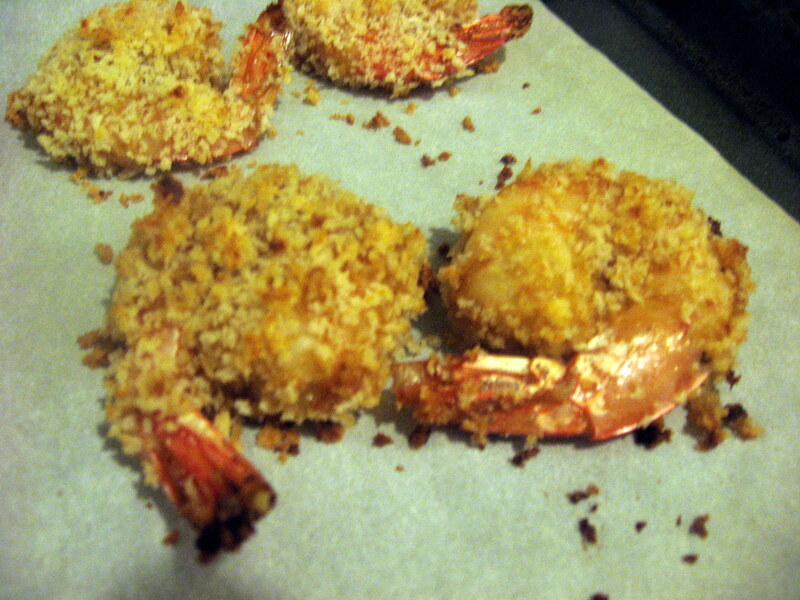 Put the shrimp into the oven and bake for about 15 minutes, until the tails turn bright pink and the crumbs develop a golden color. If desired, whisk some tamari or soy sauce with some dried ginger for dipping.